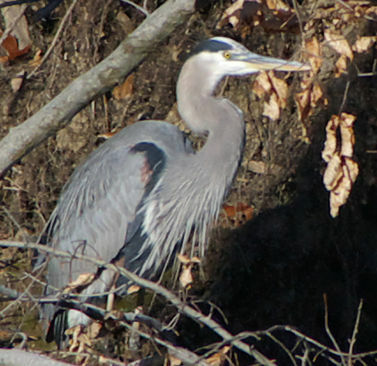 This Great Blue Heron was spotted in Accotink Creek only a hundred feet from the Lake Accotink parking area on the new Cross County Trail section south of Lake Accotink. The new route is open and provides an excellent walk in a natural wooded setting. Click on the picture to view the walk map and directions. You may have seen trail markers similar to this throughout Reston. 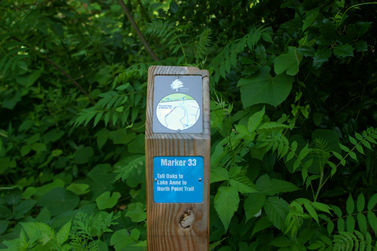 Click on the picture to learn more about the person that created the maps on these markers and a link to maps of the complete trails. Getting to know you. 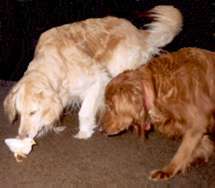 Get to know some of the pets in Reston. Click on the above picture. One of the biggest problems for people new to the area is finding superior firms such as plumbers or doctors. Consumer Reports helped to start a magazine called Checkbook to assist you with this task. Subscribers rate the firms they do business with so that others can benefit from their experience. Checkbook rates firms just as Consumer Reports rates products. Click below for a link to their websites. Both sites charge a fee to view information. Free access to the information is often provided at the local libraries. This is not an advertisement and no funds were exchanged for this recommendation. Perhaps you have been looking for software that will make writing images to LightScribe DVDs easy. Click here for a free answer to your problem. I have published some other tips that may be helpful. Click on Technical Contents for a listing. 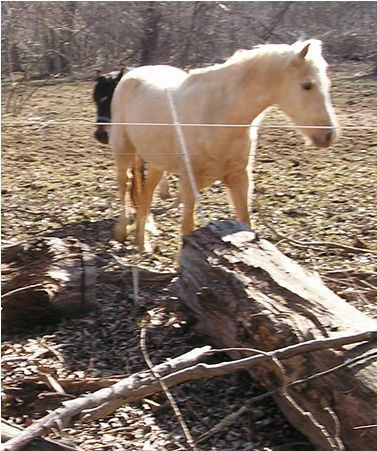 Reston is a high tech town but nearby we have miles of trails catering to horses. This is an opportunity that you may not find elsewhere. If you love to ride horses this is the place for you. Click on the picture to view some of the activities that people who love horses enjoy. The Burke Centre Railroad Station and Parking Garage opened on June 2, 2008. Several new trails have been built to connect the station to the Woods and Commons sections of Burke Centre. You may wish to consider walking rather than driving to the station. Click on the picture to view a map of the area and see how many walking minutes your home may be from the station. 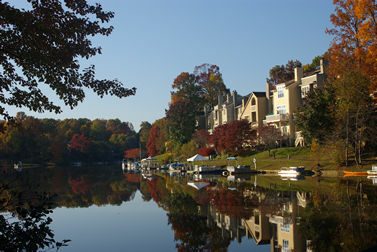 Lake Anne is a short walk with wonderful scenery. Click on the picture to view the walk map and start walking while the weather is cool. You may not have heard about Laurel Hill Park but major development is under way there. 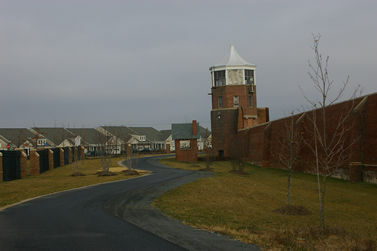 This is a view of the Cross County Trail with a watchtower in the former Lorton Prison on the right and homes in the gated Spring Hill development for seniors on the left. 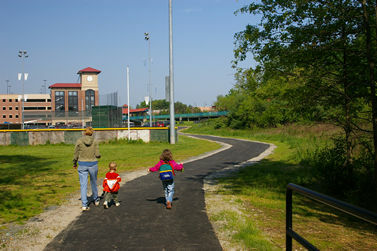 This section of the trail has not been officially opened yet but is quite walkable although no signs have been placed. Click the picture to view a walk map, pictures and directions that will take you through Laurel Hill Park. Improvements are coming to parts of Old Courthouse Road. 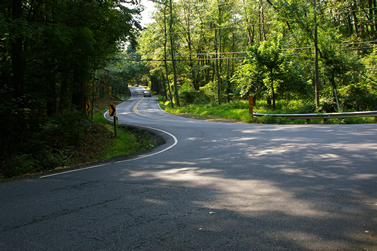 Click on the above picture to see the present road near Wolf Trap Creek. 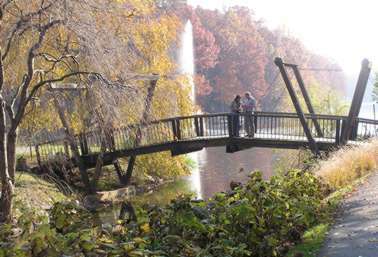 Click on one of the above pictures to view a trail or for more trails click on contents. This is the second of 2 walks on this site involving the trail along Lake Audubon. This walk will take you along a good section of the shore line with lots of views of Lake Audubon and a view of Lake Thoreau. The picture shows Lake Audubon in October. Click on the picture to view the walk map and pictures of the route.